The passion for speed, the excitement of race, the deployed ingenuity to build a vehicle that conveys great emotions: beyond the aesthetic fascination stemming from bikes, it is clear that all of this is possible thanks to the great technical work involved in the manufacturing of a racing bike, a project to be pursued with perseverance and creativity with high skills in engineering. However, the motorsport bike industry is made up of enthusiasts and experts and lacks of graduate engineers, who reveal the right skills to deal with this world from the working point of view. offering an enriching experience aimed at developing leadership and team working. Near-graduate or graduate in Aerospace Engineering. The program, consisting of 10 modules, will be carried out over a period of 7 months, for a total duration of 300 hours in classroom. Attendance is part-time on weekends. Teaching staff is made up of mechanical and electronic engineers with several years of experience in the motorsport bike industry, from specialized areas. 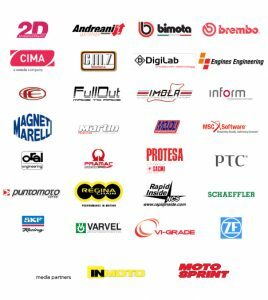 Magneti Marelli, AVL, Lamborghini, Ducati, REGINA CATENE … these and many other companies that have offered internship opportunities to students from the first four editions of the master. Licenses, for the duration of the whole Master, for the track data acquisition and processing software processed from 2Ds. Bologna city: this land boasts a priceless heritage of culture and tradition in the field of high mechanics and motor two-wheelers, so much so that dozens of brands characterized by lifelong and glorious know-how have come out during the Twentieth Century, contributing to the creation of what is now called “the Motor Valley“.